The anthology of articles that follows was compiled by the History and Museums Division during the 50th Anniversary commemoration of the Korean Conflict, 1950–1953. 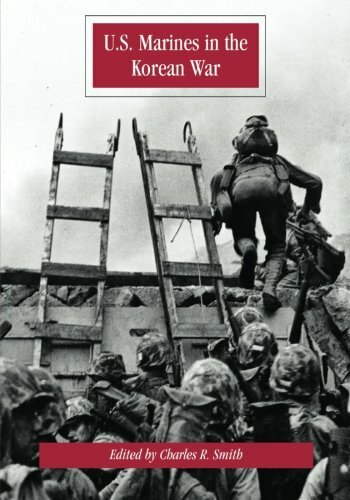 The focus of the various authors who wrote these historically related works on Korea did so to remember those Marines who fought and died in what some historians sometimes characterized as the “forgotten war.” Forgotten or not, the Korean conflict was without parallel in Marine Corps history and no one who experienced it or lived through this era could ever forget the difficulties that they would encounter there. The Korean War also represented a milestone in the developmental history of the Marine Corps. For perhaps what could very well be the last time, the Marine Corps made an opposed World War II style amphibious landing against a dedicated enemy. Korea was also the opening salvo in what became known as the Cold War. In reality, Korea represented the beginning of a series of “limited wars” that would be fought by the United States with the express political purpose of keeping such conflicts from developing into full blown world wars. Frustratingly for the men and women in uniform during the Cold War, political considerations frequently overrode military exigencies and logic. Having just successfully concluded a total war against an enemy whose objectives were clearly identifiable, the Korean conflict proved fraught with political twists and turns that made the military’s job immensely more difficult. This was especially evident during the “stalemate” phase of the war, 1952–1953. No less bloody or violent, this period of the conflict saw the Marine Corps incur a significant number of casualties. The Korean conflict was also important for operational reasons. It was clear that from 1950 on, limited wars fought by U.S. forces would be largely “come as you are affairs.” During the summer and early fall of 1950, the Marine Corps learned a valuable lesson when it had to scramble to assemble its landing force for the Inchon operation, getting the 1st Marine Division into theater in the nick of time. No longer would the United States have the luxury of time in getting forces ready for limited wars. Next, for the first time, the advent of the helicopter would play a significant role in the combat plans of Marine units in the field. Experimentation with the concept of vertical assault, using this new technology took place during the conflict. Korea would also be the first time Marines would be given personal body armor or “flak jackets” to wear in combat. Such body armor would come in handy as the war settled into a stalemate along the 38th Parallel. While Marine elements had deployed to extremely cold locations in the past such as the occupation of Iceland by the 1st Marine Brigade (Provisional) in 1941, Korea would be the first time in the modern era where the Marine Corps would have to fight in extremely cold conditions. During Korea, the Corps came away with a new appreciation for the necessity of having the proper environmental gear tested and available for use by its combat and combat support troops. In sum, Korea set the operational tone that the Marine Corps would follow for the rest of the Cold War. Jerome rated it 4 stars and had this to say, "I had two cousins that were in the Marines in Korea. I myself and another cousin joined the Marines in 1954, so this is an interesting topic for me. As for the book; It has a lot of photographs I have never seen before and is far more detailed than most as it covers the air wing as well as the ground troops of the first Mar. Div. FMF which I later served with."